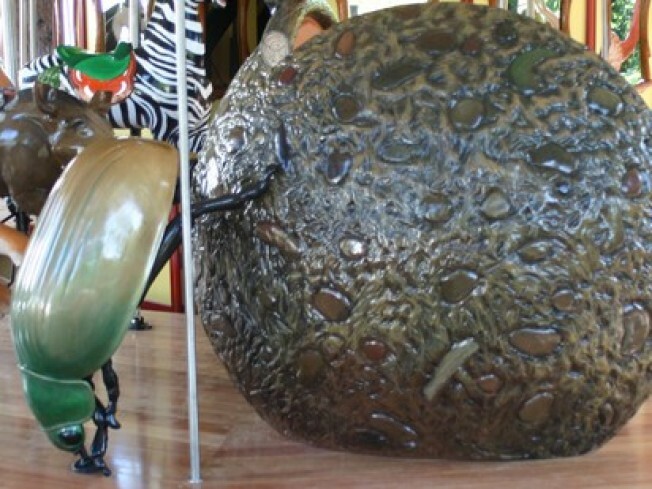 Yep, we're sweet on the carousel dung beetle. There'll be a guy just like this one on the LA Zoo's new merry-go-round. Carousels bring out the kidliness in anyone -- can you pass up riding that historic beauty on Santa Monica Pier every time you're there? -- neither can we -- and they also call upon humankind's love of animalkind. One carousel in particular, that is. The new Moss Family Conservation Carousel, which will debut in 2010 at the Los Angeles Zoo, is coming together now, and, since carousel-making is such a massive undertaking, there's a bit of time yet before it debuts. Time to consider the amazing menagerie that will call the carousel home, and how supporters of all things animal can get involved. What we're marveling at: The breadth of animalia that will be represented (the zoo notes these will be, for the most part, beasties that call the zoo home for real). We're sweet on traditional merry-go-round ponies and ostriches -- don't get us wrong -- but the Moss Family carousel will include a honey bear, a bee -- a bee! -- sweet -- a dolphin, a koala (love the wee saddle), a puffin, and a praying mantis. And, of course, a dung beetle, complete with his namesake ball of dung. That remarkable, industrious insect. Would we love to sponsor this little guy? Guess he's not so little if you can ride him on a carousel. Yes, we would. Sponsoring an animal on the carousel does cost $25,000. So dung beetle, you must be be-plaqued by another family. Oh, we didn't mention that yet -- you do get a plaque, near your animal, for 15 years, should you sponsor a figure. View all the animals, but note that they are not the final carousel figures that will be going on the LA Zoo merry-go-round. They are, rather, examples. And some animals have already got their sponsors, like the black bear and baby elephant. Greater Los Angeles Zoo Association, which raises funds for LA Zoo projects, is the the group behind the carousel.